No home or business is immune to plumbing and HVAC problems. When you encounter an issue that requires plumbing experts or HVAC services, contact Rite Rate. We’re the preferred plumbing, heating, and air conditioning company in Roselle, NJ! Our team of contractors and plumbers are available 24/7 for repairs and are fully licensed to handle all plumbing and HVAC systems. At Rite Rate Heating & Cooling, we offer quality plumbing, air conditioning, and heating repair, replacement, installation, and maintenance services. Your home or business needs a good heating system to keep the rooms at optimal temperatures during winter. Our heating company in Roselle, NJ is the expert on all makes and models of hot water heaters, boilers, and furnaces. If there’s a leak or the heat isn’t working, then contact us right away. 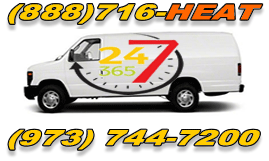 Rite Rate provides 24-hour emergency heating repair in Roselle, NJ! We respond to your call immediately and work quickly to fix your heater. In addition, we’ll replace any old or worn out parts and can install any new heater. It can be anything from a tank water heater to an oil furnace or gas boiler! You can also call us for routine maintenance to make sure your heating system is working efficiently. Air conditioning systems can be complex which is why you need a trusted air conditioning company in Roselle, NJ. At Rite Rate, we’re the HVAC experts and undertake repairs, replacements of faulty parts as well as new installations. We also offer maintenance that will help reduce utility costs while making the air conditioner more efficient and increase its longevity. When you need affordable services that are performed by professionals, contact our air conditioning company! We’re no strangers to plumbing issues that range from drain to sewer problems. If there are pipes leaking, a clogged toilet, or a backed up sump pump, we’re your go-to plumbers! We can repair or replace any broken or damaged parts that are not functioning properly. From drain and sewer cleaning to installing a new shower, Rite Rate handles it all! Other services include high-velocity water jetting, flood assistance, and installing new sinks, toilets, and bathtubs. Call Rite Rate today for a free quote on our plumbing services!